Last night, I sat down to write this but took a break part-way through to remove myself from my lovely arm and to head off for a relaxing shower. By the time I returned and awoke my laptop, I realised it was deciding to play up. Even with an internet connection, none of the tabs in my browser were responding properly. I had to reboot the computer (and a forced restart, at that) before I could type any more and, as Windows reloaded and I clicked on the Firefox icon on my desktop, I realised that WordPress had automatically saved nothing more than the opening line. I was virtually ready to hit ‘Publish’ but now, I’m stating again. My mind was clouded with other thoughts last night so, maybe this is for the better. 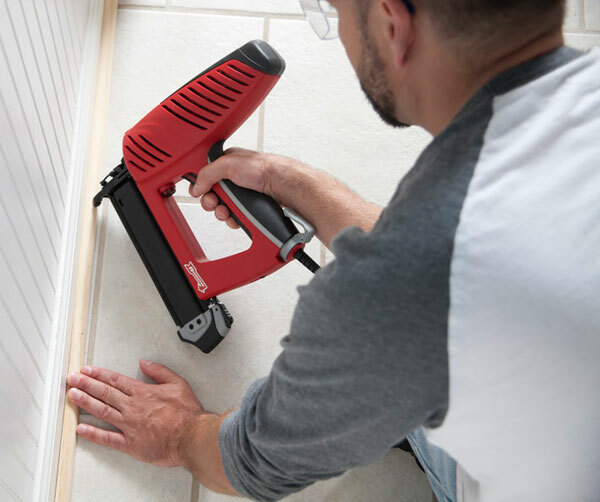 Arrow EBN320 RED Electric Brad Nail Gun (Photo credit: D&M Tools). My day job isn’t one that I particularly enjoy. It doesn’t involve working with wood but, mostly to the extent of fixing sheets of plywood together with nail guns to construct packing cases. Not the sort of fine-quality work I’ve been trained to produce but still, it does just about pay the bills and I can only imagine it is better than working in a confined, stuffy office. In over eighteen months now, this role has taught me the significance a pin gun (you might refer to them as brand nailers) can bring to a woodworking workshop. I do own an electric pin gun… The only problem is that it went ‘bang’ and died on me last summer after years of grossly infrequent use. It was only a cheap model, costing much less than £50 (yes, you do get what you pay for) and, to be honest, it was never that great… Somewhere within the instructions, they should’ve added a few lines about needing a hammer to finish the job off – if not a pair of pliers or pincers when the tool infrequently double-fires! Still, I believe that there is a place for a pin gun/brad nailer within the home workshop. Like some other woodworkers, I don’t own a compressor and, for the sake of the noise and disturbance they create, I don’t ever intend to have one and the ‘quiet-running’ models are rather expensive for a humble hobbiest or part-timer. Previously, the Maestri (now Spotnails) brand has maintained a good reputation for mains-powered pinners. But they are quite expensive and even second-hand models are rare. Using a pin gun/brad nailer (Photo credit: D&M Tools). My imagination has convinced me that a brand nailer would be a godsend for constructing jigs and workshop aids. Imagine being able to hold a strip of MDF or block of hardwood in place while you wait for the glue to dry… Without using a clamp! Glue can often cause two mating pieces to slide about while you’re getting ready to insert some screws. A couple of pins would help prevent that! 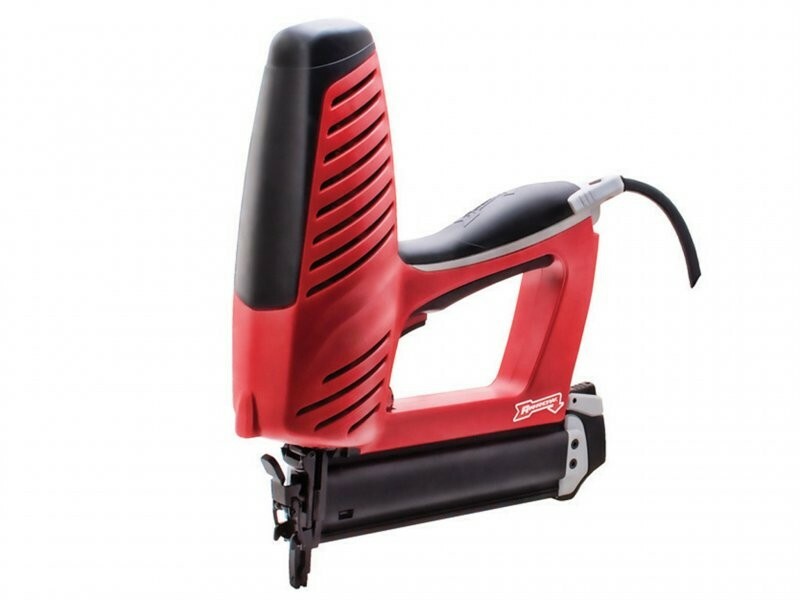 Looking around online, I could only find two positive reviews for the Arrow EBN320 RED brad nailer and I quite fancy the prospect of being ‘one of the first‘ in the UK to own, write, review and maybe even video-blog about this tool; even if I don’t desperately ‘need‘ it.